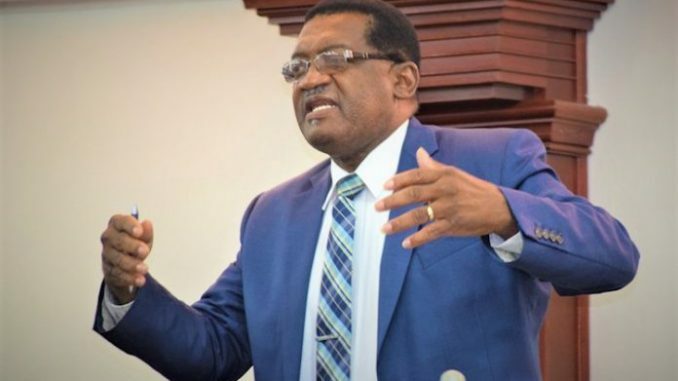 A resident of St. Kitts’ constituency number eight and the former People’s Labour Party Chairman, Douglas Wattley, recently confirmed that the St. Kitts-Nevis Labour Party correct with regard to Minister of Health, Gender Affairs, Human Settlement, Eugene Hamilton: he is highly incompetent. In a radio appearance this past March, Wattley revealed that he was the person who designed and compiled the human settlement policy that Hamilton presented to Cabinet early in the coalition’s term. He stated that this was something he consented to do after an inordinate amount of begging and pleading from Hamilton. “.…Eugene begged me ‘Please, Dougie, please, Wattley, help me out here!’ because his colleagues in Cabinet were giving him hell, saying that he was inept! Eugene called me from Mexico in February of 2016 and said that the Prime Minister complained him to Shawn. I said ‘Well, why he gonna complain you to Shawn?’. He said ‘He is giving the impression that he [Eugene] is inept, that he doesn’t have a handle…’. Wattley went on to explain the inordinate rush Hamilton was in to present the policy to Cabinet due to the fact that his first proposal was fraught with ignorance and ineptitude. Douglas Wattley’s sterling testimony served to confirm the Labour Party’s accusation of ineptitude on Minister Hamilton’s part. It also provided additional reasoning behind the sordid and dysfunctional state of affairs the country has been witnessing within the Ministry of Health.